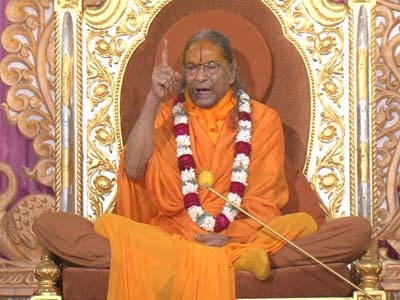 Jagadguru Shri Kripaluji Maharaj: Karma Yoga in True Sense.. Whenever you perform any God-related work, you should first understand that it is the worldly work. In the same way, you receive many visitors if there is a wedding at home. You receive them with great respect; you feed them different kinds of foodstuff; you accommodate them in hotels. And once the wedding party leaves; once your daughter is married and out of your house, you feel relieved. You say, “Thank God.” So in the world, you get away with performing actions without the attachment of the mind, because worldly people are not all-knowing. They have no way of knowing whether you truly love them or are merely putting on an act. But you cannot put on an act with God. He is sitting inside of you. He starts noting down your action from the time it is in the form of a thought. God does not take note of physical actions. You may spend millions of rupees to host a Vedic ceremony, a yagya, give to charity, observe fasts, or do something else, but God will not take note. He only takes note of the percentage of the attachment of the mind. If you don’t do anything physically, God will not mind. But devotion, or karmdharm performed without attachment of the mind will not be accepted. In fact, it will be considered mere hypocrisy. And to be hypocritical with God or a saint, is a very serious spiritual transgression. Therefore, keep in mind at all times that it is the mind which has to perform Godly works. You people sit in the hall early in the morning for the recital of the daily prayer. Have you considered what ‘prayer’ is? None of you is meditating on God while praying. One person recites the prayer like a parrot, and the others follow suit. You are looking here and there; you are thinking something or the other, and simultaneously mouthing the words of the prayer. I listen, and it hurts me to listen. What can I do? I am tired of explaining things to you.